This diagnostic tool was created by Marc Amsler, an Opthalmologist from Switzerland, in 1945. This test does not replace the need for a comprehensive eye exam conducted by a certified Optometrist, but it does help an individual assess and monitor symptoms of Macular Degeneration as soon as they arise. 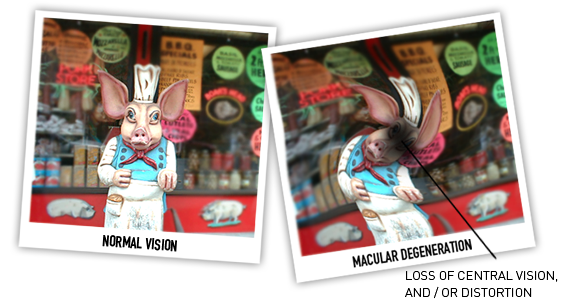 Learn more about Macular Degeneration. Make sure you are in a well-lit room. In the case that you wear glasses, have them on for the assessment. 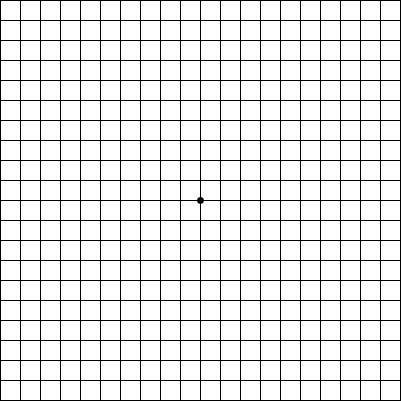 Position your eyes 12-14 inches away from the Amsler Grid. Cover one eye, and with the open eye, focus on the black dot in the center of the grid. Answer the 5 questions above the grid in relation to your visual experience. 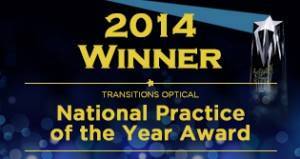 Report these notes to your Optometrist. Repeat the test with your second eye. Please note that an Amsler Grid should not be solely relied upon for a conclusive diagnosis. Make sure to consult with your Optometrist if you have even one "Yes" response to any of the five questions while conducting the test. Feel free to download a printable version as well.